With most economists squarely focused at today's GDP growth rate, one aspect of today's GDP report that was largely ignored, was the wide-ranging revision to historical data that the BEA released alongside the latest numbers. What it showed was a doozy: on a chained (real) dollar basis, the US economy was estimated to have reached a $18.5 trillion level in Q2 2018. Putting this number in context, the last pre-revision number was $17.37 trillion as of Q1, which has now been revised to $18.3 trillion. This means that the BEA has "revised" the US economy to be $1 trillion higher, which while generally arbitrary and likely involves fudging the deflator, will mean that US debt/GDP just dropped significantly. 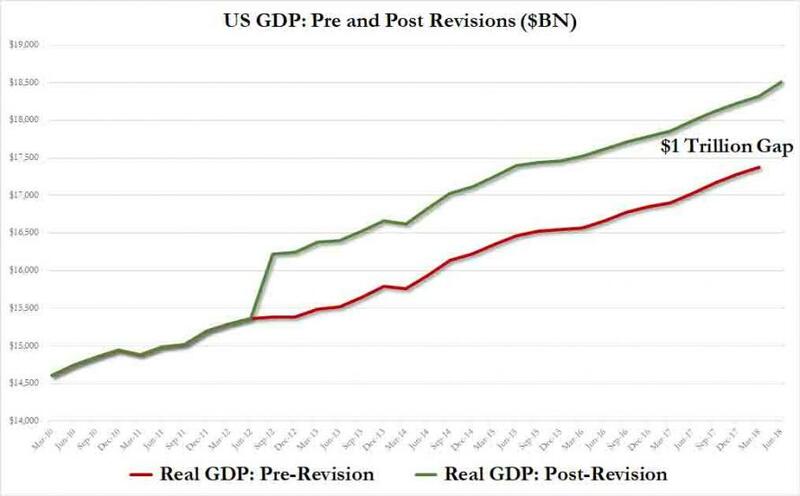 The revision also hit the nominal, unadjusted numbers, which increased by a smaller margin, but enough to push the US economy to its first $20+ trillion level, or $20.4 trillion to be exact.